An information property list is structured text specifying configuration details for an application or other bundled executable. The operating system extracts data from an information property list at runtime and processes it in suitable ways. For example, when they list applications in the Home screen or in the Finder, iOS and OS X (respectively) get these names from the information property lists of installed applications. 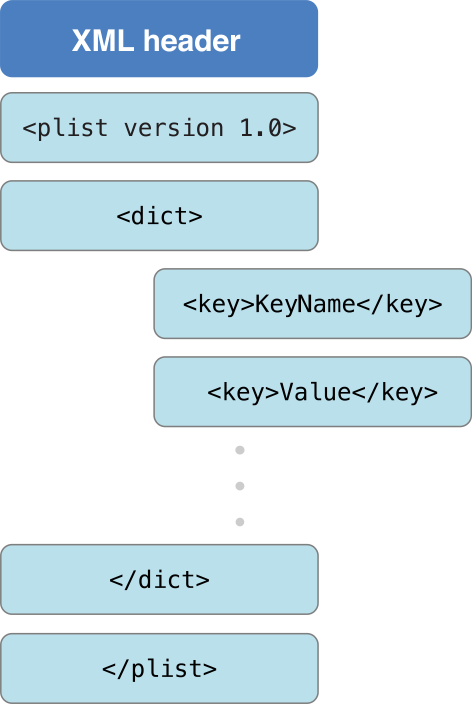 The contents of an information property list are structured in a special form of XML where the root node is always a dictionary. The dictionary contains a series of key-value pairs, or properties, where the key is a key element and the value is an element that indicates the data type of the value. Properties specified in an information property list include display name, bundle identifier, bundle icon, bundle version, supported platforms, and document types. The name of an information property list file must be Info.plist, with letters in lowercase or uppercase as shown. The text in the file is encoded in Unicode UTF-8. When you build an application or other bundle, the file is put in a certain location in the bundle. When you use Xcode (the primary development application) to create a project for an application or other bundle, Xcode creates a file named ProjectName-Info.plist in your project’s Resources folder. (When you build your project, the tools copy this file to the bundle as Info.plist.) Xcode configures some properties in ProjectName-Info.plist for you, but you often have to specify additional ones. You may edit the information property list in Xcode’s editor by selecting the file directly. You can also edit some properties in the Properties pane of the target inspector.